The city’s ban on billboards mounted to trailers and parked on city streets was upheld this week by the 9th Circuit Court of Appeals. A San Fernando Valley company responsible for many of the billboards had sued the city shortly after the 2011 enactment of the ban, claiming that it violated the company’s First Amendment rights. The lawsuit was filed by Lone Star Security and Video against Los Angeles and the cities of Santa Clarita, Rancho Cucamonga, and Loma Linda, all of which enacted mobile billboard bans after the state legislature passed enabling legislation in 2010. That legislation was sponsored by Assemblyman Bob Blumenfield, who was elected earlier this month to the L.A. City Council. In 2012, a federal District Court Judge denied Lone Star’s motion for an injunction prohibiting the city from enforcing the mobile billboard ban. The company then appealed that ruling to the 9th Circuit. Bruce Boyer, the owner of Lone Star Security and Video, has been an outspoken opponent of the city’s decade-long battle against the mobile billboards, which first appeared on San Fernando Valley streets but then spread to other areas of the city. In 2010, he attempted to disrupt a news conference held by Blumenfield to announce passage of the state law. 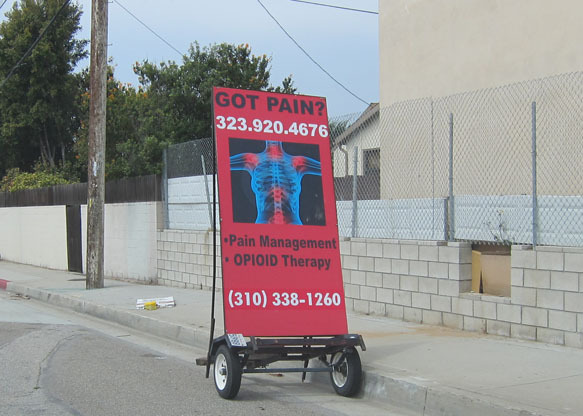 City Councilman Dennis Zine, who represents the southwest area of the San Fernando Valley and pushed for the city’s ban, was quoted at the time as saying that his office received more resident complaints about mobile billboards than any other issue.